In our country, approximately 70% of laboratories still use manual HiCN method for Hb estimation especially in rural areas. Hence, the need to have non cyanide methods for Hb estimation in our country to avoid the environmental pollution by cyanide reagents. There are no Indian studies on comparison of alkaline hematin methods with HiCN. We formulated a simple, novel cyanide free cheap reagent from locally available materials using quarternary ammonium compounds as lyser in an alkaline borate solution. 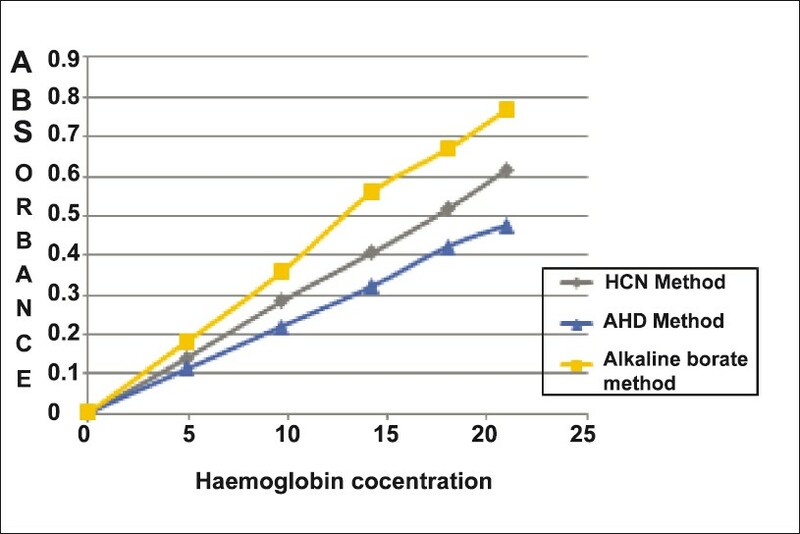 The hemoglobin estimation by the AHD-triton and alkaline borate method were compared with hemoglobin estimation by HiCN method. We further evaluated the scope of non cyanide methods of Hb estimation for testing Hb of blood donors in outdoor blood camps on light emitting diode (LED) based portable battery operated colorimeter. The study was carried out in the department of pathology of a tertiary public care hospital in a Mumbai city. Fresh blood anticoagulated with ethylene diaminetetraacetic acid -dipotassium (EDTA-K2) was used. Capillary blood by finger prick method was used for hemoglobin estimation in blood donor camps. Drabkins reagent was obtained from Perfect Biologicals. The AHD reagent was prepared by dissolving 25 grams of Triton X-100 in one liter of 0.1 mole of NaOH (Reagent Grade) with PH of 11.8. The Alkaline- Borate reagent was prepared by adding 10 gm of MyTAC (Myristyl trimethyl ammonium chloride) which is a quarternary ammonium compounds in 5 mmoles/L sodium tertraboronate (Borax) and 5 mmoles/L NaOH with a pH of 11.3. 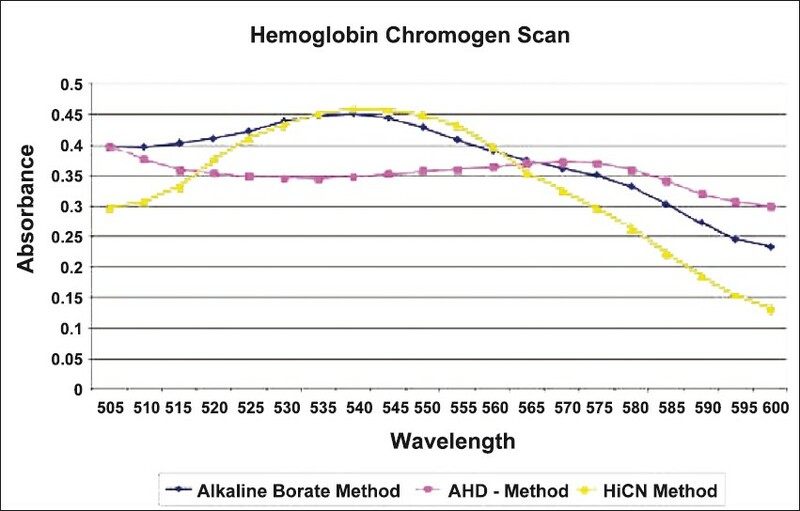 The absorption curves of the hemochromogens formed in non cyanide methods were recorded with a scanning spectrophotometer (Genesis UV10) between 400-700 nm. Fresh blood (20 μl) was added to the reagent (4 ml) and mixed thoroughly. The absorption curves were recorded within 20 seconds. Calibration of hemoglobin: Primary whole blood traceable calibrator (Biorad) was used to calibrate the colorimeter for Hb estimation with HiCN method. Secondary blood standard was prepared by HiCN method. These secondary standards were used to calibrate AHD method and alkaline borate method for Hb estimation. The factor obtained was as follows; 34.3 in HiCN method, 43.3 in AHD method, and 26.7 in alkaline borate method. HiCN Method: Add 20 μl blood in 4 ml Drabkins reagent (1:200 dilution). Wait for 10 minutes and the readings are taken at 530 nm by colorimeter. AHD Method: Add 20 μl blood in 3 ml AHD reagent (1:151 dilution). Wait for three minutes and the readings are taken at 580 nm by colorimeter. Alkaline borate Method: Add 20 μl blood in 4 ml of alkaline borate reagent(1:200 dilution). Wait for three minutes and take the reading at 530 nm by colorimeter. The timed kinetics of three methods of Hb estimation was done by running the freshly prepared Hb samples on the semiautoanalyser and the readings were recorded at the interval of three minutes for 60 minutes. Linearity: The linearity was checked on Hb concentrations from 3 gm% to 20 gm% by three methods. The whole blood was concentrated by removing the supernatant plasma and the value was adjusted to 20 gm by HiCN method and then serial dilutions were prepared up to 3gm%. 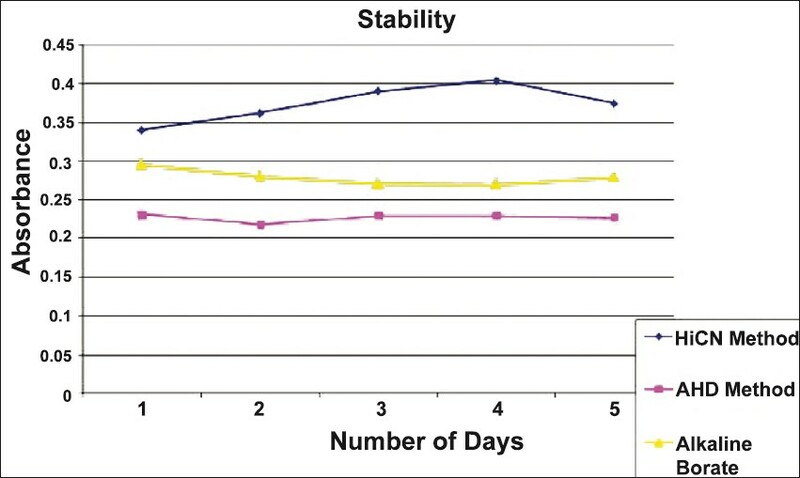 Stability: The stability was tested by recording the readings of Hb concentrations of five samples after 4 hours, 24 hours, and 48 hours up to four days. Precision: The mean, standard deviation (SD) and coefficient of variation (CV) was calculated for all three methods. The Hb sample of known concentration (11 gm%) was prepared by adding 20 μl of blood in four ml of reagent. The sample is mixed and absorbance readings were taken 20 times consecutively of single sample and Hb concentrations were calculated. The mean, SD, and CV are calculated on these 20 readings. This gave the instrument measurement uncertainty. The same sample was pipetted 20 times and 20 readings were taken and Hb concentrations were calculated. The mean, SD, and CV were calculated on these 20 readings which gave total system measurement uncertainty (pipetting + instrument). The cost of reagents used in cyanide Drabkin`s method and cyanide free methods, AHD, and alkaline borate method were evaluated. Two hundred test blood samples were studied by these three methods which had varying Hb concentrations and also included 50 samples of high leukocyte counts greater than 20,000 per μl. Twenty five (25) blood samples of infants were also tested and compared by these methods. The statistical analysis used in the study is Pearson`s Correlation Coefficient. Correlations were ranked as excellent (r=0.93-0.99), good (r=0.80-0.92), fair(r=0.59-0.79) and poor (r<0.59). Semiautoanalyser, Kanad Vidyut (Model Shreerang 01) was used for timed kinetic studies. Genesis UV Spectrophotometer was used for measuring absorption spectra of reagents. The Digital Colorimeter instrument LED based (light emiting diode) of Model HANS 356 (Kanad Vidyut) was used in our study in blood camps which is portable and can be battery operated. The capillary blood drawn by bold finger prick is used i.e., 5 μl of blood added to 1 ml of alkaline borate reagent predispensed in cuvettes. Hemoglobin was estimated in one hundred blood donors; in 50 blood donors, Hb was done by AHD-triton method and in 50 blood donors by alkaline borate method. These values were later compared with HiCN method. Absorption Spectra: The [Figure 1] shows absorption curve formed by the cyanide reagent with peak absorption at 540 nm. In comparison, AHD reagent had absorption peak at 580 nm whereas alkaline borate had two absorption peaks at 530 nm and 575 nm. 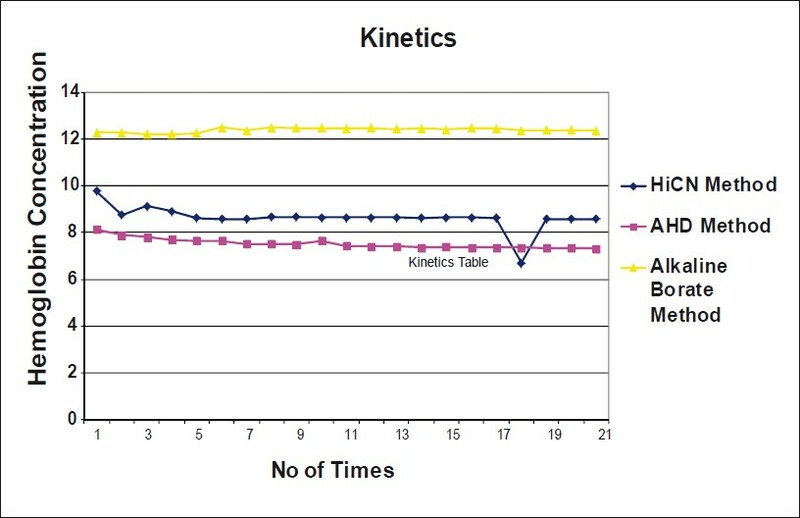 Kinetics: The sharp fall of optical density was seen after third reading corresponding to 10 minutes in HiCN method indicating the conversion of Hb to HiCN takes at least 10 minutes. In AHD and alkaline borate method, reaction takes place immediately in less than three minutes as seen from the graph in [Figure 2]. The standard deviation and coefficient of variation obtained by these three methods is within normal range of acceptability. Linearity: The [Figure 3] shows a linear graph of varying Hb concentrations from 3-20 gm%. Stability: The stability of hemochromogens formed by the three methods was observed by recording absorption readings at 530 nm and 580 nm for four days consecutively. The cyanide free reagent methods produced stable absorbance readings remaining unchanged till four days which is depicted in [Figure 4]. The running cost of reagents for one test in AHD-triton, alkaline borate method and HiCN method is 10 paise, 30 paise, and 100 paise, respectively. The correlation between HiCN method and AHD-Triton, HiCN method, and Alkaline borate was done using Pearson`s correlation coefficient. Excellent correlation was observed between the non cyanide methods and HiCN method which is depicted in [Figure 5]. The correlation coefficient of 0.96 and 0.97 is statistically significant at P<0.000 which indicates that the calculated value of r is unlikely to have resulted from random chance. The possible effect of leukocyte counts on Hb measurement was examined by comparing the correlation and from a series of blood samples with high leukocyte counts (>20,000 WBC/μl). The correlation coefficient was r=0.97 indicating no effect of leukocytes on Hb estimation. Hb results of infants by HiCN method was compared by non cyanide methods and the correlation was excellent, though r value was slightly on lower side (r=0.94). This is explained as the fetal Hb is resistant to alkaline reagents used in non cyanide methods. The cyanide free methods were utilized for screening blood donors at the camp site. The LED digital colorimeter was used and calibrated with the whole blood standard and a factor was derived which was fed into the colorimeter (factor for AHD-575 was 43.3 at wavelength 580nm, factor for alkaline borate method was 26.7 at wavelength 530nm). The Hb concentrations were obtained immediately by the direct readings. These results were later compared with standard HiCN methods in the laboratory. There was excellent correlation (r=0.97). In our country, majority of the laboratories, especially in rural areas, still use manual HiCN method for Hb estimation. The main cause for concern is the presence of cyanide in the reagent having toxic effects which are well known. The HiCN reagent has potential risk to laboratory personnel who handle the reagents. The laboratory effluents in the drainage containing cyanide is harmful to aquatic life in low concentrations and is dangerous if allowed to enter and contaminate domestic water tanks, irrigation water supplies, and lakes. A novel lauryl sulfate hemoglobin colorimetric method has been described and evaluated for use in automated analysers. The pigment formed is stable for only four hours at room temperature, and hence, the method is not ideal for manual use in busy health facilities. Newer hemoglobinometers which measure the hemoglobin concentration of lysed blood directly without dilution are now available; however, they are expensive and use disposable cuvettes, both of which make them unsuitable for use in developing countries. The AHD- triton method like hemiglobincyanide method involves diluting small volumes of blood (which must be accurately pipetted) in a lysing solution (AHD reagent) prior to a colorimetric measurement. The AHD-triton reagent is not toxic or photosensitive and also the AHD reagent is stable for eight months at 4-8* celsius which agrees with findings of Zander et al. The basic reagent for AHD method is Triton X- 100, which is a non-ionic detergent, causing the lysis of red blood cells. The alkaline borate method uses quarternary ammonium compounds and is cheaper than AHD. The main advantage of this method is that the reading can be taken at wavelength of 530 nm (which is also the same in Drabkins method). Hence, same hemoglobinometer (colorimeter) designed for the hemiglobincyanide method is also suitable for use with alkaline borate method. The reaction is very fast in non-cyanide methods, takes less than three minutes whereas conversion time in HiCN method takes 9-10 minutes. The cost of reagents used in Hb estimation by these three methods was evaluated and cost was 10 paise, 30 paise, and 100 paise for AHD method, alkaline borate method, and HiCN method, respectively. Some newer colorimeters are fitted with light emitting diode (LED) that emits light at fixed nm- 530 nm, 580 nm, and 630 nm. The LED based instruments are inherently stable because there is very little drift and the factor derived is stable for a long time and do not require frequent calibration. Our instrument was calibrated and factor was fed in the instrument. We used our LED colorimeter in blood camps and tested the Hb by non cyanide methods for the donors. The Hb readings were then compared with standard hemiglobincyanide method. The correlation was excellent (r=0.97). However, some hemoglobinometers designed for the hemiglobincyanide method are also suitable for use with non cyanide methods offering flexibility in their utility. The hemoglobinometers equipped with LED`s and health centers that already have such instruments can therefore easily use non cyanide methods for Hb estimation. The cyanide free reagents are acceptable and desirable for routine laboratory analysis both from its safety standpoint and its stability in determining hemoglobin. The flexibility and low cost of non cyanide reagents offers practical advantages which clearly warrant its introduction into health facilities and also in providing point of care testing in blood banks. 1. Zijlstra WG. Standardisation of Hemoglobinometry: History and New Challenges. Comp Hematol Int 1987;1:125-32. 2. Lewis SM, Garvey B, Manning R, Sharp SA, Wardle J. Lauryl sulphate hemoglobin: A non hazardous substitute for HiCN in haemoglobinometry. Clin Lab Haematol 1991;13:279-90. 3. Tsuda I, Tatsumi N, Zhang Z, Kubota H, Takubp T. Evaluation of Coulter`s cyanide - free reagent for hemoglobinometry. Lab Hematol 1998;4:276-80. 4. Theodorsen L. Automated cyanide - free method for hemoglobin determination on Technicon H1. Scand J Clin Lab Invest 1990;50:643-8. 5. Lema OE, Carter JY, Arube PA, Munafu CG, Wangai MW, Rees PH. Evaluation of the alkaline haematin D-575 method for hemoglobin estimation in east Africa. Bull World Health Organ 1994;72:937-41. 6. Moharram NM, El Aouad R, Al Busaidy S, Fabricius A, Heller S, Wood WG, et al. International collaborative assessment study of the AHD- 575 method for the measurement of blood haemoglobin. East Mediterr J 2006;12:722-34. 7. ICSH EXPERT PANEL on Haemoglobinometry: Recommendations for reference method for haemoglobinometry in human blood (ICSH Standard 1986) and specifications for international haemoglobinocyanide reference preparation (3 rd ed). Clin Lab Haematol 1987;9:73-9. 8. International Council for Standardisation in Hematology: EXPERT PANEL on haemoglobinometry: Recommendations for reference method for haemoglobinometry in human blood (ICSH Standard 1995) and specifications for international haemoglobinocyanide reference preparation (3 rd ed). J Clin Pathol 1996;49:271-4. 9. van Assendelft OW, Horton BR, Parvin RM. Calibration and control in haemoglobinometry. Clin Lab Haematol 1990;12:31-42. 10. Zander R, Land W, Wolf HU. Alkaline haematin D-575, a new tool for the determination of hemoglobin as an alternative to the cyanhaemoglobin method. Description of the method. Clin Chim Acta 1984;136:83-93.